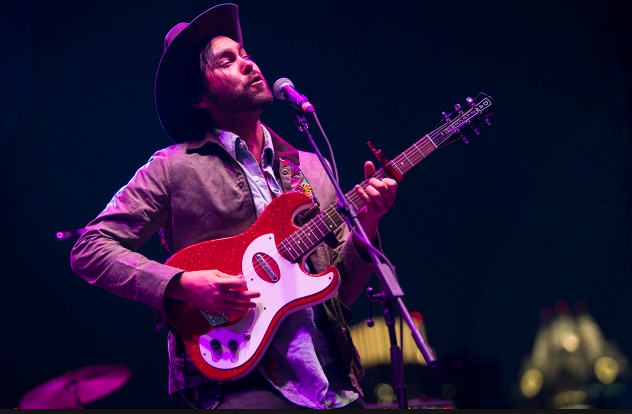 Alejandro Rose-Garcia, better known by stage name Shakey Graves, has long since been an Austin icon. A self-proclaimed ‘Texas gentleman,’ his prophetic lyrics and unapologetic DIY sound have earned his catalog regard as one of folk-rock’s greats. His signature suitcase kick drum, perfectly homemade and casual, epitomizes the distinctive one-man band style of his past recordings and live performances. Undeniably, Rose-Garcia has come a long way from those early days of Bandcamp releases and solo shows. The 2014 drop of album And the War Came marked the beginning of his transition to a more polished sound and filled out live set, of which he shared his thoughts on while opening for City and Colour in June of 2016. “There’s nothing wrong with needing a little help from your friends,” he explained. Although the recent re-release of The Donor Blues and Nobody’s Fool EPs one summer later seemed to indicate a potential return to his earlier bedroom style, upcoming record Can’t Wake Up suggests the contrary. Last Friday marked the passing of the seventh annual Shakey Graves Day, a holiday declared by the City of Austin. As in previous years, Rose-Garcia’s entire discography was made available at a pay-what-you-want rate on Bandcamp for a little over 60 hours. In conjunction with this, he released two tracks off of recently announced album Can’t Wake Up, which will be put out by Dualtone on May 4th. Collectively known as The Sleep EP, “Counting Sheep” and “Kids These Days” will appear as songs one and two on the forthcoming record. Although they offer only a sneak peak in to what’s to come from Rose-Garcia, it is clear that his second full length studio project will shift away from the acoustic roots he’s best known for. “Counting Sheep” is nearly five minutes of atmospheric late-night reminiscing. Dreamy and longing, this track is a distinctive departure from Shakey Graves’ previous catalog. His music has always been guitar and vocal forward, but “Counting Sheep” diverges from that standard and starts the new record off on different a trajectory. 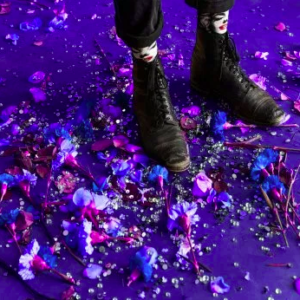 Although he is embracing heavier production and a more psychedelic sound, the song still seems like classic Shakey Graves. Exactly what about “Counting Sheep” preserves that integrity is unclear, but also arguably insignificant. What matters is that Rose-Garcia has managed to gracefully balance reinvention with continuity, and progression with sincerity. “Counting Sheep” exemplifies that. “Kids These Days” is all nostalgia. Reflective and existential, Shakey Graves’ lyricism remains strong as ever. The song is melancholic and at times self deprecating, and much like “Counting Sheep,” it makes sense among the rest of his work— even with The Sleep EP’s sonic re-imagination taken into account. The influence of indie rock is obvious on this track in regard to both sound and subject matter, and it’s easy to imagine “Kids These Days” being a hit. Fun and driving in its address of the simple but profound observations of adolescence, the song is pleasantly relatable. Once again, Rose-Garcia finds success as he navigates this new musical direction. The Sleep EP says exciting things about what we can expect from Can’t Wake Up. Further, “Counting Sheep” and “Kids These Days” reframe the summer 2017 re-release of The Donor Blues and Nobody’s Fool EPs. Rather than a prognosis for whats to come, these projects may have instead been an homage to Shakey Graves’ past sound as he transitions into a new sonic space. Although the shift away from Rose-Garcia’s signature one-man band style may be bittersweet for some, The Sleep EP indicates that we’ve still got plenty to look forward to. Attempts at approaching ‘mainstream’ indie in a fresh and unique way hold the potential to test any artist’s longevity. So far, Shakey Graves is up to the challenge.